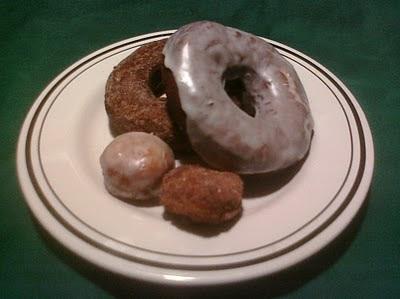 When I couldn't decide what recipe to make, I received a few requests for Apple Cider Doughnuts. Cathy told me that she and Gregg absolutely LOVE them, so I immediately chose to accept the mission. I found several recipes, but this one seemed to be the right one for me. It's easy to mix up and they taste AMAZING. I think the key to it is the fact that you reduce the apple cider down to practically a syrup. That's what gives it the deliciously concentrated appleness that I love. Is that a word? Appleness? Well, you know what I mean. It's sweet and appley and warm and comforting. Is that a word? Appley? Oh, and yes, you can dredge them in sugar and cinnamon, but in my opinion, it's all about the cider glaze. One bite and you'll taste just how appletastic they are!!! 1. Boil apple cider in small saucepan until it is reduced to 1/4 cup, 8 to 10 minutes; cool. 2. Beat sugar with shortening until smooth. Add eggs and mix well, then add buttermilk and reduced cider. Stir together flour, baking powder, baking soda, cinnamon, salt and nutmeg in another bowl. Add to liquid ingredients; mix just enough to combine. 3. Transfer dough to lightly floured board and pat to 1/2-inch thickness. Cut with 2 1/2- to 3-inch doughnut cutter; reserve doughnut holes and reroll and cut scraps. 4. Add enough oil or shortening to fill a deep pan 3 inches. Fry several doughnuts at a time, turning once or twice, until browned and cooked through. Remove to paper towels with slotted metal spoon. 5. Roll in cinnamon and sugar or dip in cider glaze. For glaze, mix confectioners' sugar and cider. Dip doughnuts while warm; serve warm. Although the recipe doesn't require it, I felt that the dough was much easier to handle after I chilled it for an hour or so. You could absolutely mix up the dough on a Saturday afternoon or evening and then let it chill in the fridge until Sunday morning. And who doesn't love warm fresh doughnuts on a Sunday morning? I'm just sayin'!